The exact calculation of a healthy weight will be different for each child but generally a healthy weight is determined not simply by a number on a scale, but also by how much a given weight supports him/her in growing, developing and remaining active. Though there are some tables that indicate that at a certain age and height a child should be a certain weight, but this is only half-true. These charts do not take into account factors such as growth rates, build size and muscle mass. Instead of worrying about fitting your child’s weight into a generic category, instead focus on keeping your child healthy and a natural weight will likely fall into place. In modern society it can be confusing to remember what a healthy weight is, much less why it is physically important for children to remain within healthy weight guidelines. Children’s personal weight needs to be tracked so that their unique healthy weight can be determined as an indicator of overall health and development. Maintaining a healthy weight will not only keep children away from becoming worn down and run the risk of illness and infections, but from developing health conditions such as diabetes, high blood pressure and high cholesterol, both in the near and distant future. 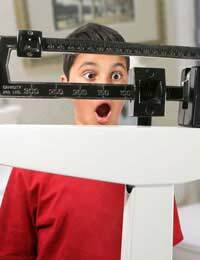 One commonly accepted method of calculating if a child is at a healthy weight is to divide the child’s weight (in kilograms) by his or her height in meters, squared. This results in a single digit, and this is the child’s Body Mass Index (BMI). Depending upon which percentile the BMI falls into then determines whether or not the child is considered to be at a healthy weight. Your GP will be able to tell you more, and help you determine, your child’s BMI. Portion sizes that will result in a health weight for your child. 5 different fruits and vegetables per day. 2-3 servings of milk or dairy per day. A serving (or less!) of fatty or sugary foods per day, including sugary drinks. At least six glasses of water per day, and more if he/she is athletic and active. A healthy weight will be a different number for each child, but tracking your child’s individual weight, growth and general development will help you determine if your child, and your family, is living a healthy lifestyle. If you have questions about your child’s weight, be sure to consult your GP for further information.